Thank you for the privilege of serving you and our wonderful Southern Lehigh community. It has truly been a pleasure getting to know each of you and bringing Southern Lehigh fair, accurate, local news coverage. Effective immediately, publication of the Southern Lehigh Tribune will be suspended indefinitely. While it may resume in the future, at present other work has to come first for the sake of family. We regret any inconvenience this may cause. Thank you again for your support and friendship! 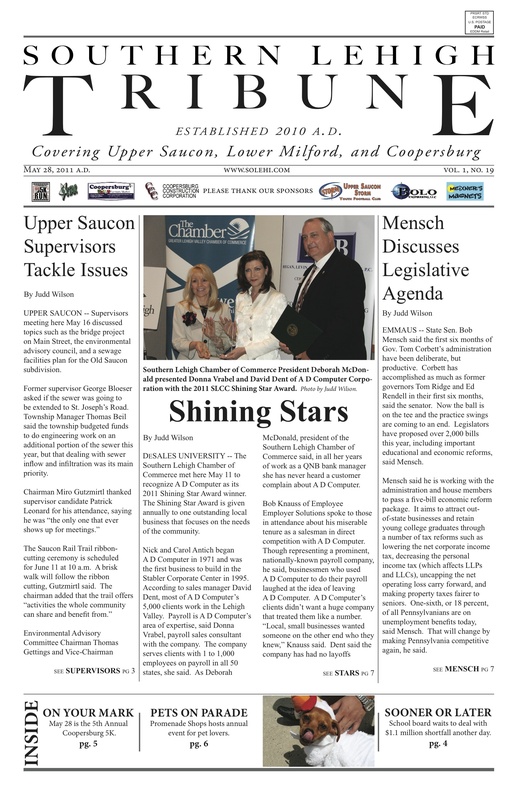 Click here to read the May 28 Southern Lehigh Tribune, featuring stories on the Southern Lehigh Chamber of Commerce, State Sen. Bob Mensch, and much, much more! Come visit the Coopersburg Farmers’ Market each Thursday at 3:30-7 p.m. at the Village Shopping Center on Main Street in Coopersburg! Open weekly from June through October. Includes local produce, fresh baked goods, community organizations, health food, and more! For more info, visit http://www.coopersburgfarmersmarket.org or email wendy@coopersburgfarmersmarket.org. Register for 2011 youth football with the Upper Saucon Storm at 610-282-8600 or uppersauconstorm@gmail.com! Learn more at www.uppersauconstorm.com. Now that the weather’s warming up, please contact Southern Lehigh’s own Five Star Lawn Care and Landscaping at 610-967-1853 or fivestarlawns@hotmail.com to take care of all your springtime needs, and tell them the Tribune sent you! Having repairs or renovations done for the summer? 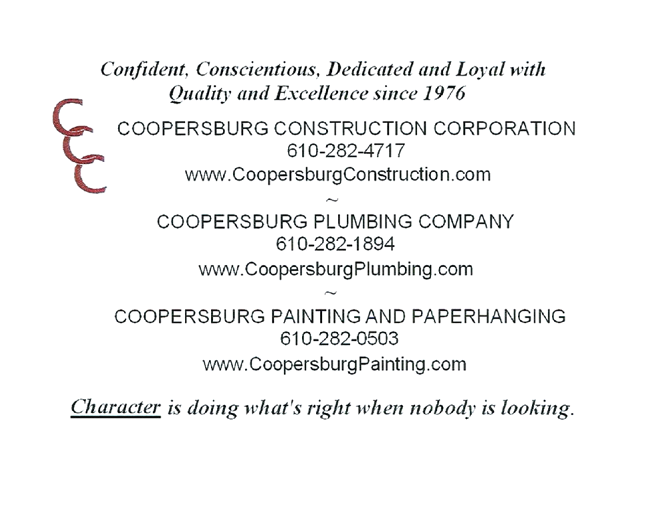 Contact Coopersburg Construction Corporation at 610-282-4717, Coopersburg Plumbing Company at 610-282-1894, or Coopersburg Painting and Paperhanging Company at 610-282-0503 today to get great service and great prices. You can also contact them on the web at www.coopersburgconstruction.com, or in person at 203 Charles St. in Coopersburg. Planning on putting in a patio, deck, or pool in your Upper Saucon residence? Did you know that projects disturbing over 500 square feet of land require a grading permit? Contact Rod Chirumbolo with Bolo Engineering to help guide you through the township ordinance process. Call 610-297-2868, email rmc@boloeng.com, or visit http://www.boloeng.com. Stop in at Meixner’s Awards and More for magnets, t-shirts, business cards, or anything else that can be printed on! Go to 551 East Station Ave. in Coopersburg, call 610-662-5525, or www.meixnersmagnetstogo.com for more information. Visit your new hometown florist, Distinctive Florals by Mary, for $9.99 wrist corsages, $4.99 boutonnieres, $12.99 large hanging baskets and roses for $9.99 per dozen! Call 610-282-2211, visit www.distinctiveflorals.net, or stop by at 551 East Station Ave. in Coopersburg to place your order. Thanks as always for your continued support of our community’s only locally owned news source — the Southern Lehigh Tribune! 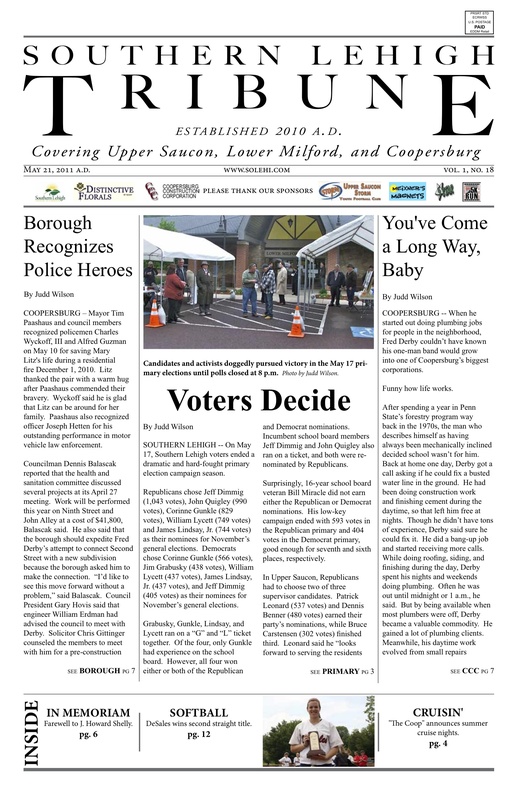 Click here to read the May 21 Southern Lehigh Tribune, featuring stories on Tuesday’s primary election results, Coopersburg Borough Council, and much, much more! It’s also available at over 30 locations around Southern Lehigh. See inside or scroll down for a full listing of distribution locations. Don’t forget to register for the 5th Annual Coopersburg 5K, Kids’ Fun Run, and Health & Wellness Expo coming up on Saturday, May 28! See Page 5 for a registration form and information, or go to http://www.coopersburg.org to register online. Visit one of these locations to find the Southern Lehigh Tribune! Click here to read the May 14 issue of the Southern Lehigh Tribune, with pages and pages of information on candidates in the May 17 primary elections. It’s also available at over 30 locations around Southern Lehigh. See Page 7 or scroll down for a full listing of distribution locations. Visit Meixner’s Awards and More for magnets, t-shirts, business cards, or anything else that can be printed on! Go to 551 East Station Ave. in Coopersburg, call 610-662-5525, or www.meixnersmagnetstogo.com for more information. 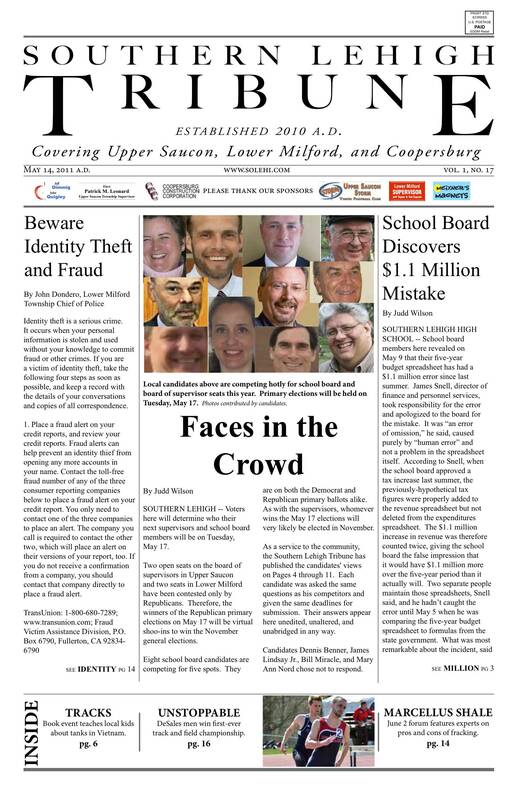 Click here to read the May 7 issue of the Southern Lehigh Tribune. 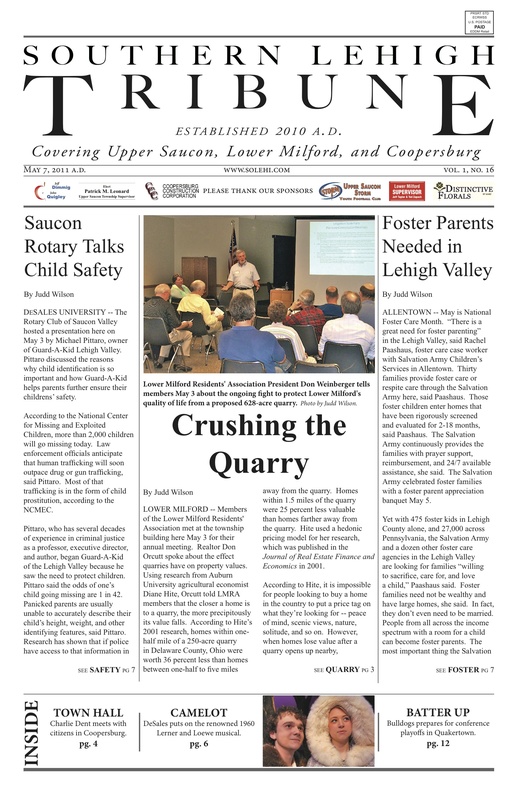 Inside you’ll find articles on the Lower Milford Residents’ Association, Saucon Valley Rotary Club, Salvation Army foster care program, and more! It’s also available at over 20 locations around Southern Lehigh. See Page 4 or click here for a full listing of locations. $9.99 per dozen roses available for Mother’s Day and prom from Distinctive Florals by Mary. Delivery always available! Call 610-282-2211, visit www.distinctiveflorals.net, or stop by at 551 East Station Ave. in Coopersburg to place your order. Got computer problems at home or at work? Call Mark Stahly of A-B-E Onsite Computer Services to get the bugs out of your hardware or software. Reach him at 610-282-3898, 267-767-6823, mstahly@frontier.com, or www.abeon-sitecomputerrepairs.com. Microsoft and CompTIA Certified Professional. 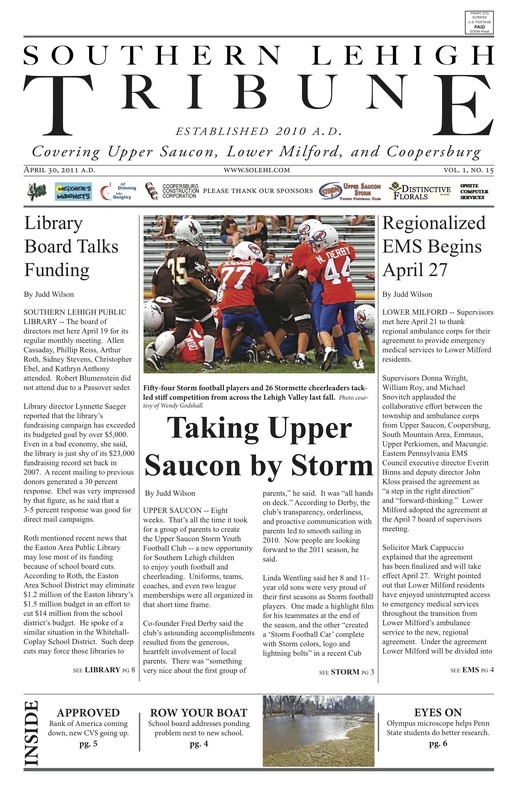 Click here for articles on regional EMS in Lower Milford, the Upper Saucon Storm Youth Football Club, Southern Lehigh Public Library Board of Directors, and much, much more! $9.99 per dozen roses available for Mother’s Day and prom from Distinctive Florals by Mary. Delivery always available! Call 610-282-2211, visit http://www.distinctiveflorals.net, or stop by at 551 East Station Ave. in Coopersburg to place your order. Register for 2011 youth football with the Upper Saucon Storm at 610-282-8600 or uppersauconstorm@gmail.com! Learn more at http://www.uppersauconstorm.com. Visit Meixner’s Awards and More for magnets, t-shirts, business cards, or anything else that can be printed on! Go to 551 East Station Ave. in Coopersburg, call 610-662-5525, or http://www.meixnersmagnetstogo.com for more information.